The Surface is a frustratingly difficult film to discuss because it revolves around mysteries so plainly obvious that I’m not sure what I can and can’t tell you without ruining the, um…surprises? The story follows two strangers suddenly trapped together on a sinking boat in the middle of Lake Michigan. I never doubted their reasons for being on the boat, and didn’t realize I was even supposed to until they started prodding each other with shifty conversations about their circumstances. So spoiler warning, I guess. I won’t reveal any particular “revelation,” but you’ll pick up on the clues quickly. Very, very quickly. 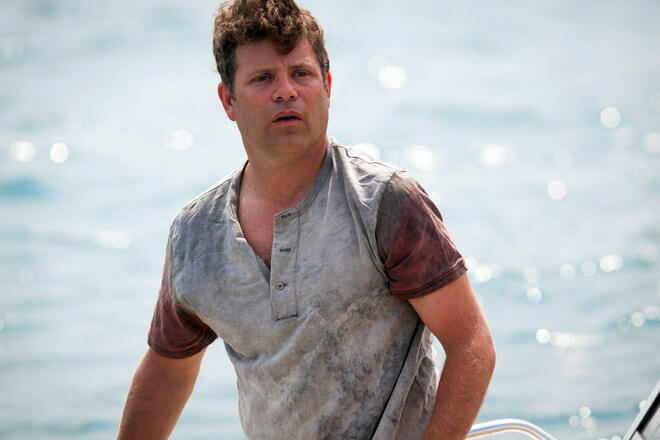 Director Gil Cates Jr.’s new film opens on a distractingly cheap looking digital effect, which it insists on returning to several times throughout during flashbacks, before introducing us to the pouty Mitch Lowe (Sean Astin). After paying a peculiarly solemn visit to his ailing mother, Mitch packs his dad’s old motorboat with a sack of mysterious fluids and sets out for open water. Just as Mitch is about to down a bottle of an especially mysterious-looking mysterious fluid, he comes across a crashed single-engine plane and manages to save it’s pilot. The pilot’s name is Kelly (Chris Mulkey, a leader in the realm of “that guy” actors who deserves to have one of his few leading roles in something more thoughtful than this), and his first reaction after being saved is to pull a knife on Mitch. Although we look at Kelly’s knife, crashed plane and suspicious overprotection of a backpack, and can instantly understand exactly what he is, The Surface seems to think that he’s some grand mystery to us. The film spends almost half of its runtime dropping hints and clues about secrets of the two leads that we instantly understood. As a thriller that fails in the worst way it can, by not being the least bit thrilling, the only redeeming quality of The Surface is that it’s just terrible and not God-awful. I will actively despise a God-awful movie like Paul Blart: Mall Cop 2 for the rest of my life. I will forget about a terrible movie like The Surface in a couple of weeks. So I suppose that’s something. Astin and Mulkey are satisfactory in their poorly conceived roles. Cates Jr. wasn’t thinking about how much the film depended on the chemistry of its leads, so he put the biggest names he could get in a boat and told them to act dramatic. There’s other bad storytelling stuff going on in The Surface besides the bad mystery stuff on the boat. Frequent flashbacks to the mainland mostly exist to allow what should have been a short film to have an appropriate feature run time. Mimi Rogers pops up in them, giving The Surface another recognizable enough name to bank on. Cate’s Jr. even tries to make the film something of a love song to Milwakee and Lake Michigan, but all we learn is that Milwakee is a pretty indistinguishable midwestern city and the water in Lake Michigan may or may not be dirty—which is, unfortunately, the most compelling mystery in The Surface. Cutting Room for May 15Brilliant nastiness takes over a tight arena.